Wind power is a renewable energy source that does not rely on fuel. It does not generate harmful emissions into the atmosphere that depletes our ozone layer. Despite that, there are numerous challenges faced by wind farm operators and questions that need to be address. One of these is how stable is its power supply? Wind energy is fuel by the earth’s irregularities, providing an attainable source of electricity. It is proven that power acquired from the wind has a lesser environmental impact than those power plants run by fossil fuel. Wind energy is also a more cost efficient power source that we use today. Although wind energy is the cleanest source of power, its construction and operation has been one of the major issues raised by locals. In a landscape view, wind turbines are clearly visible and not that intrusive however, once you get close to it you will see that a single wind turbine takes up too much space. Wind farms also possess potential risk on local ecology and the wildlife in it. Sound is also a factor that a wind farm faces today. Research shows that some of the windiest site to place wind farms are heavily protected by mountainous regions. Other large areas that are ideal for its construction are protected by conservation restriction. Wind farms constructed near the sea are costly and difficult to build however it is achievable. Wind turbines ideally need to operate in exposed sites where they could make use of the prevailing winds. These structures are massive that they invade space. Sound emission from wind farms are divided into two categories: Mechanical and Aerodynamic sound. The earliest wind turbines have terrible insulation and design that produces ruckus. Mechanical noise created by the gear box and generator were the cause of annoying sound. 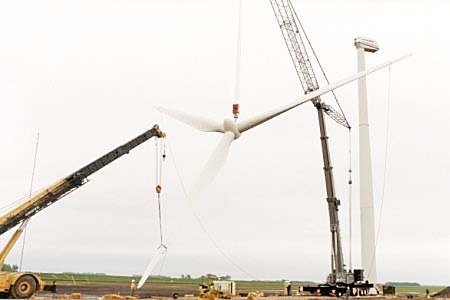 The designs of the blades were also a factor on why the previous wind turbines were another source of the sound as well. Despite this, newer versions of wind farms have tried to fix these issues making sound emissions a lesser concern for the individuals living nearby. Wind farms evade so much space that it affects the ecology and wildlife in it. They cause temporary or permanent habitat loss in sandbanks, water body and land areas due to disturbance. Migratory routes are also affected by wind farms; birds and bats collide into the rotor blades injuring or killing these species unintentionally. Light emissions attract birds that subsequently increase the risk of collisions to these massive structures. Marine mammals induce permanent or temporary threshold shifts with their perceptions through the significant masking of sounds cause by construction and pile driving. Vibrations, clouding and sedimentation during wind farm construction damages fish eggs and disturb their spawning grounds. Despite the challenges faced by wind farms, research and assessment are made to alleviate the impact on the environment. Potential problems are easily identified through the process and were given counter measures to mitigate the impact of its effects. Is Nuclear Power Green Energy? © InvestInGreenEnergy.com All rights reserved.